Citric Acid, Malic Acid, Natural and Artificial Flavor, Sucralose, Acesulfame Potassium, Lecithin, Glycine, FD&C Blue #1. Take 1 serving (1 full scoop) before intense training with 4 to 6 oz (120-180 ml) of cold water. Ideal for use before intense physical activity. Stay adequately hydrated. NOTE: Highly concentrated. Never exceed 1 scoop at a time. ALLERGEN WARNING: Contains Soy. Produced in a facility that also handles Milk, Wheat, Egg and Tree Nuts (Coconuts). Not for use by individuals under the age of 18. Do not use if you are pregnant or breastfeeding. Ensure to drink enough fluid before, during, and after exercise. Consult a healthcare practitioner prior to use: if you have any medical condition including high blood pressure; if you are taking any prescription or over the counter drug. Discontinue use if you experience any adverse reaction. Do not use if the seal under the lid has been tampered with. Store in a coold dry place, KEEP OUT OF REACH OF CHILDREN. Citric Acid, Malic Acid, Natural & Artificial Flavor, Sucralose, Acesulfame Potassium, Lecithin, FD&C Red #40. Mix it with ice-cold water, slam it back, hit the iron, and leave the rest of the [email protected]#king world in your dust! Ideal for use before intense physical activity. Stay adequately hydrated. 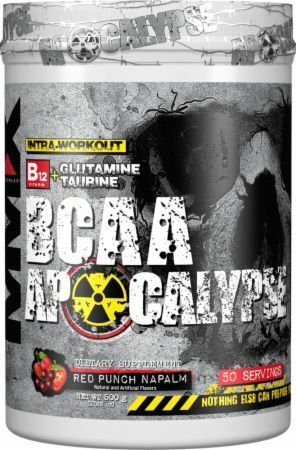 BCAA APOCALYPSE comes in two amazingly delicious flavors, Blue Wraithberry and Red Punch Napalm.